A tiny green tree frog came to visit the other night, just one of the many improbable creatures that are here amongst us that I seem to be focusing on these days. Turning on the light in our bathroom I caught the quick blurred movement of a greenish spot no bigger than a thumbprint. Looking more closely, I spotted a bright green frog clinging to the wall, flattened and in a disk like one of those tin clickers you get for parties. I gathered him up in my hands but he squirted out a couple of times before Dave could open the front door for his release to freedom into the night. Similarly, a small praying mantis startled me when I sniffed a large pink rose blooming along our front property wall. He moved from behind the blossom just as I brought it to my nose, putting us eye-to-eye. After such a rude introduction he ambled off onto the rose leaves where his sweet green blended more perfectly, awaiting other more fruitful encounters, no doubt. The grapevines outside our door, I’ve found, are home to a couple sphinx moth caterpillars. Big as a man’s thumb and about 3 inches long, their grayish-brown skin with diagonal stripes along their sides makes them difficult to spot as they glide along the thick vines. Our maid’s little boy, Eddie, pointed them out to us as we stood last week contemplating whether or not the peaches on the tree outside our front door were ripe enough to pick. After Marta swept them off the vines with her broom I had to convince her that the mariposa nocturna (moths) that these rather frightening creatures would eventually morph into were worthy of saving. Their horn spot, meant to look like an eye, gives them the appearance of a Cyclopes, though in reality they are blind. I picked one up and placed it back on the woody vine and Eddie followed my example with the other, though not before menacing his mom with the little wormy. The improbable indeed has seemed to have crept into our lives of late. Weeks of looking at property around San Miguel after our hoped-for lots in Colonia Mexiquito fell through made our prospects of finding something reasonable within our price range and specifications seem all the more questionable. We were turning over every rock but finding little to inspire us. Worse, our time frame to get underway seemed to be slipping rapidly away from us. Obviously we could not go on indefinitely looking for property without consuming the very funds we would need to build our house. After some days in a funk over our situation, we began to hash out the possibilities before us. Maybe San Miguel wasn’t right after all, we wondered. But the question always came back to where, if not here. Paducah, Kentucky crept into the conversation. It seemed a likely candidate because of its central location and its artist relocation program. Our trip there last summer had piqued our curiosity but hadn’t quite convinced us. But now, with the sands seeming to shift under our feet, it deserved another look. A peek at their website showed promising progress within the community with new artists and intriguing houses at reasonable prices. It’s funny how when a decision is finally reached, especially one that seems almost inspired, doubly when it’s been within arms’ reach all along, that the rest of the puzzle falls into place. 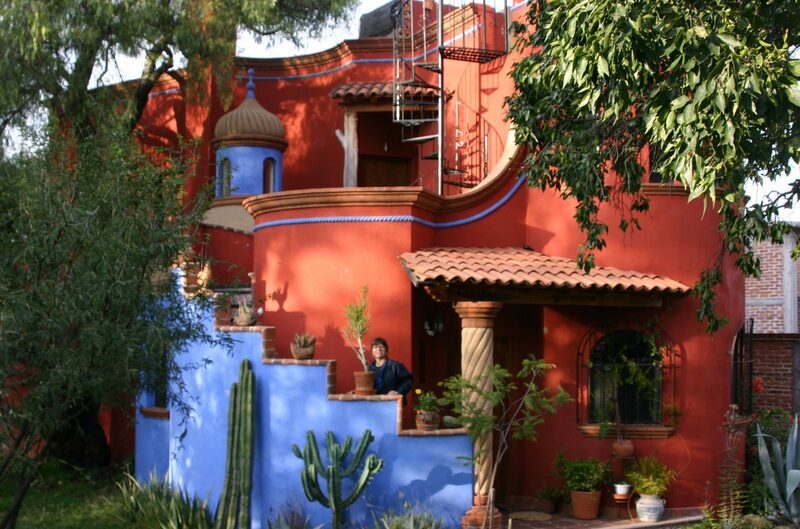 Realizing the rightness of Paducah for this point of our lives as a home base for establishing our art careers in the States, within hours we also found the right piece of property to suit us in San Miguel, a place to fulfill our dream of an artists’ retreat. One that is a mere fraction of the price and twice as big as anything else we’ve looked at in all these past months. And if all that weren’t enough to convince us, the charm of the surrounding village of Alcocer and the bucolic countryside trumped the deal. Like the little green tree frog, the improbable and unexpected had landed in our laps.